Offers:Up to £320 off selected dates. 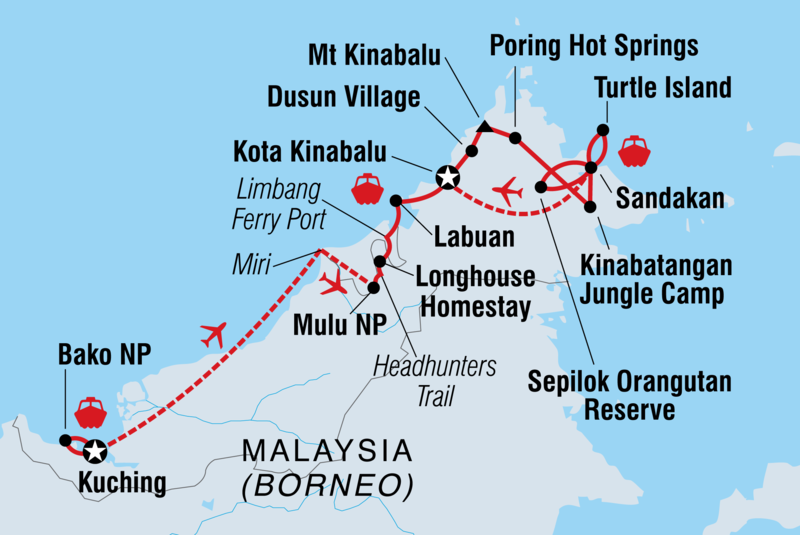 Travel with a small group on a Borneo highlights tour and you’ll instantly become immersed within a world of steam-shrouded jungles and remote tropical beaches with the ever-present form of Mount Kinabalu rising from Sabah as Malaysia’s mightiest mountain. From Mulu National Park and the Headhunters’ Trail to Turtle Island and the world-renowned orangutan sanctuary, Sepilok, a Borneo highlights tour as a small group leaves no stone unturned when it comes to conjuring up stunning scenes alongside no end of exciting activities. This three week Borneo highlights tour lets you experience the sunsets, the homestays and the hiking trails way beyond the tourist sites as you explore as part of a small group and discover the wild nature of the island as well as the relaxing, laid back charm of Southeast Asia. We take care to use local transport throughout, On the Kinabatagan River you will be welcomed into the lives and homes of local villagers for the night. The families will prepare an amazing dinner and you will have the chance to get a better insight into life in Borneo. We source produce locally throughout the trip, eat at local restaurants and encourage our travellers to purchase souvenirs from local artisans and recruit our on the ground team from the local community. This not only gives a fantastic insight into the country and a snap shot of day to day life, but it also puts valuable financial resources back into the local economy, creating jobs and supporting local businesses. In an effort to support conservation in Borneo, we visit the Sepilok Orang-utan Reserve and Turtle Island in the Seligan National Park where we learn about these fragile environments and their inhabitants.